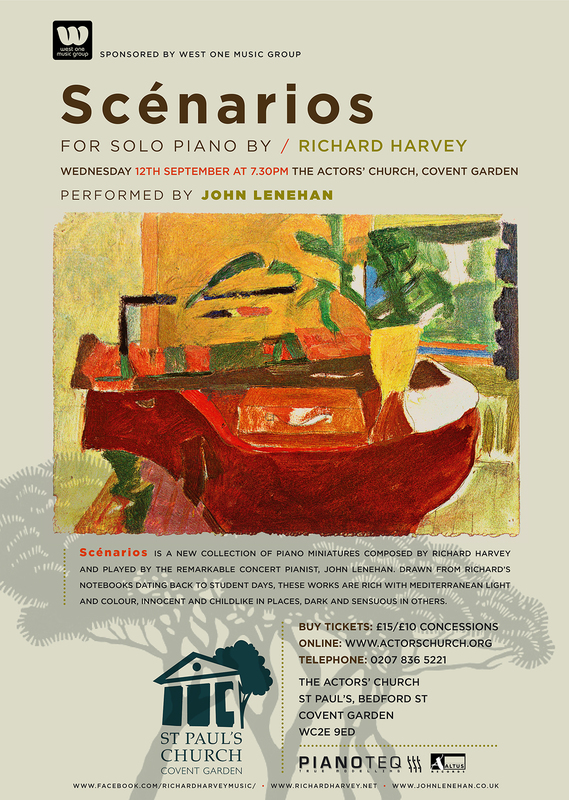 Scénarios is a new collection of piano miniatures composed by Richard Harvey and played by the remarkable John Lenehan. Drawn from Richard’s notebooks dating back to student days and rich with Mediterranean light and colour, they are innocent and childlike in places, dark and sensuous in others. In celebration of the new release John Lenehan will be taking to the stage at St Pauls Church, Covent Garden, for a unique one-of-a kind concert on September 12th. Alongside the lovely in-house piano we will be using the amazing Pianoteq computer-modelled piano. This is a French hi-tech marvel that allows performers to take the sound of an individual instrument of their choice with them on a plane, into a hotel room or – in this case – onto the concert stage. This is believed to be the first time a pianist of John Lenehan’s stature has chosen to use one of these extraordinary devices for part of a major London concert. Pianist John Lenehan’s performances and recordings have been acclaimed wherever he goes. The Times called a recent recital of John’s “masterly” and the New York Times hailed his “great flair and virtuosity”. John has appeared as a soloist with the LSO at the Barbican and the RPO at the Royal Albert Hall and his recitals have graced the great concert halls of Amsterdam, Vienna, Salzburg, New York, Washington, Toronto, Seoul, Beijing, Shanghai and Tokyo. Scénarios is released through Altus Records on 7 September. Available on Altus Records, iTunes, Spotify, Amazon, Google Play and over 200 other platforms worldwide.